While my soul was exciting itself with ardent yearnings for receiving the grace that Jesus Himself wanted to give me, Jesus came back and transported me outside of myself, up to Paradise. And there, in the presence of the Most Holy Trinity and of all the Celestial Court, He renewed the marriage. Jesus put out the ring adorned with three precious stones, white, red and green, and He gave it to the Father, who blessed it and gave it back to the Son again. The Holy Spirit took my right hand and Jesus placed the ring on my ring finger. Then I was admitted to the kiss of all the Three Divine Persons, and each of Them blessed me. Who can tell my confusion when I found myself before the Most Holy Trinity? I will just say that as soon as I found myself in Their presence, I fell flat to the ground, and I would have remained there if it wasn’t for Jesus, who encouraged me to go into Their presence, so much was the light, the sanctity of God. I am only saying this; the other things I will leave out, because I remember them confusedly. After this, I remember that a few days passed and I received Communion. I lost consciousness, and I saw, present before me, the Most Holy Trinity whom I had seen in Heaven. I immediately prostrated myself at Their presence, I adored Them, I confessed my nothingness. I remember that I felt so plunged within myself that I did not dare to utter a single word, when a voice came from Their midst and said: “Do not fear, pluck up courage, We have come to confirm you as Our own, and to take possession of your heart.” While this voice was saying this, I saw that the Most Holy Trinity descended into my heart and took possession of it – and there They formed Their dwelling. Who can tell the change that occurred in me? I felt divinized; it was no longer I who lived, but They were living in me. It seemed to me that my body was like a residence, and that the living God was residing in it, because I could feel, sensibly, Their real presence in my interior. I could hear Their voice clearly, coming from within my interior and resounding at the ears of my body. It happened precisely as when there are people speaking inside a room, and their voices can be heard, clearly and distinctly, also outside. From that moment on, I no longer had the need to go in search of Him somewhere else in order to find Him, but I could find Him there – inside my heart. And there, in the presence of the Most Holy Trinity and of all the Celestial Court, He renewed the marriage. Jesus put out the ring adorned with three precious stones, white, red and green, and He gave it to the Father, who blessed it and gave it back to the Son again. The Holy Spirit took my right hand and Jesus placed the ring on my ring finger. Then I was admitted to the kiss of all the Three Divine Persons, and each of Them blessed me. Other times, in this hiding of Jesus and my going around in search for Him, when He would make Himself felt inside of me and then come out from within me, I would find not Jesus alone, but all Three Divine Persons – now in the form of three children, gracious and immensely beautiful, now with one single body and three distinct heads, but resembling each other, all three of them attractive. Who can tell my contentment? Especially when I would see the three children, whom I would hold, all three of them, in my arms. I would kiss now one, now another, and receive their kisses; now one would lean on my shoulder, another on the other shoulder, and another would remain in front of me. And while delighting in them, I would go about looking at them and, to my amazement, from three I would find one. Another amazement for me when I would be with these three children, was that each one would weigh as much as the three of them together. I would feel as much love for one of these children, as for all three of them together; each one of them attracted me in the same way. How she sees the Divinity of Jesus – The sun is fire, but it is also light and heat. Here is the Most Holy Trinity veiled in the sun: the fire is the Father, the light is the Son, the heat is the Holy Spirit. However, the sun is one, and just as one cannot separate fire from light and heat, so one is the power of the Father, Son and Holy Spirit, who in reality cannot be separated from one another. And just as fire produces light and heat at the same time, in such a way that fire cannot be conceived without light and heat; in the same way, the Father cannot be conceived before the Son and the Holy Spirit, and vice versa, but all Three of the Them have the same eternal beginning. How she sees the Divinity of Jesus. After the confessor told me to explain to him how I sometimes see the Divinity of Our Lord, I answered that it was impossible for me to be able to tell him anything. But, at night, blessed Jesus appeared to me and almost reproached me because of this refusal of mine, and then He flashed through me with two most luminous rays. With the first one I understood in my intellect, that Faith is God and God is Faith. I tried to say a few things about Faith; now I will try to say how I see God – and this was the second ray. While I am outside of myself, and I find myself in the height of the heavens, I seem to see God within a light. He Himself seems to be light, and within this light there is beauty, strength, wisdom, immensity, height, depth – endless and boundless. Even in the air we breathe is God present, and we breathe Him; so, each one can make Him his own life, as indeed He is. Nothing escapes Him, and nothing can escape Him. This light seems to be all voice, though it does not speak; and all operating, though it always rests. It is present everywhere, though it occupies no space; and while it is present everywhere, it also has its own center. Oh, God, how incomprehensible You are! I see You, I feel You, You are my life, You restrict Yourself within me, but You remain always immense and lose nothing of Yourself. Yet, I feel I am stammering, and it seems I can say nothing. In order to explain myself better, according to our human language, I will say that I see a shadow of God in the whole creation, because in the whole creation – someplace He has cast the shadow of His beauty, someplace His fragrances, someplace His light, as in the sun, in which I see a special shadow of God. I see Him as though concealed within this sphere, as the king of all other spheres. What is the sun? It nothing but a globe of fire. One is the globe, but its rays are many; from this we can easily understand how the globe is God, and the rays are the immense attributes of God. Second. The sun is fire, but it is also light and heat. Here is the Most Holy Trinity veiled in the sun: the fire is the Father, the light is the Son, the heat is the Holy Spirit. However, the sun is one, and just as one cannot separate fire from light and heat, so one is the power of the Father, Son and Holy Spirit, who in reality cannot be separated from one another. And just as fire produces light and heat at the same time, in such a way that fire cannot be conceived without light and heat; in the same way, the Father cannot be conceived before the Son and the Holy Spirit, and vice versa, but all Three of the Them have the same eternal beginning. Delight of the Holy Trinity because of the sufferings of Luisa. In one instant, I went about looking and I saw Three Persons who, surrounding me, delighted in looking at this cross. However, lamenting to Them, I said: ‘Great God, too little is my suffering, I am not content with the cross alone, but I also want the thorns and the nails; and if I do not deserve this, because I am unworthy and a sinner, certainly You can give me the dispositions in order to deserve it.’ And Jesus, sending me a ray of intellectual light, made me understand that He wanted me to make the confession of my sins. I felt almost floored before the Three Divine Persons, but the Humanity of Our Lord inspired me with confidence; so, turning to Him I recited the Confiteor, and then I began to make the confession of my sins. Now, while I was all immersed in my misery, a voice came out from Their midst, saying: “We forgive you, and you – sin no more.” I was expecting to receive the absolution from Our Lord, but all of a sudden He disappeared. After a little while He came back crucified, and shared with me the pains of the cross. Luisa sees the mystery of the Most Holy Trinity in the form of three Suns. After I had gone through days not only of privation, but also of disturbance, this morning, as I was yet more disturbed about my miserable state, adorable Jesus, on coming, told me: “By being restless, you have disturbed my sweet rest. Ah, yes, you do not let Me rest any more!” Who can say how mortified I was left in hearing that I had deprived Jesus Christ of rest? In spite of this, I calmed down for a few hours, but then I found myself more restless than before, to the point that I myself do not where I will end up this time. After those few words spoken by Jesus, I found myself outside of myself, and in looking into the vault of the heavens, I saw three Suns: one seemed to set in the east, another in the west, and the third in the south. The splendor of the rays that they sent forth was so great that they united with one another, in such a way as to become one. I seemed to see the mystery of the Most Holy Trinity, and man, formed with the three powers in Its image. I also understood that for one who stayed in that light, his will would be transformed in the Father, his intellect in the Son, his memory in the Holy Spirit. How many things I understood! But I am unable to manifest them. The nature of the Most Holy Trinity is formed of most pure, most simple, communicative Love. While They were saying this, I could distinguish my beloved Jesus very well, recognizing the image of the human nature in Him, and only because of Him I had the confidence to remain in Their presence; otherwise, who would have dared? Ah, yes! It seemed to me that the humanity assumed by Jesus had opened commerce for the creature, so as to let her ascend up to the throne of the Divinity to be admitted to converse with Them, and to obtain deeds of graces. Oh, what happy moments I enjoyed! How many things I understood; but in order to describe something, I would have to describe it when my soul is with my dear Jesus, as she seems to be set free from the body. But as I find myself imprisoned again, the darkness of the imprisonment, the distance of my mystical Sun, the pain of not seeing Him, render me incapable of describing it, and make me live dying. Yet, I am forced to live, fastened, imprisoned in this miserable body. Ah, Lord, have compassion for a miserable sinner who lives infirm and imprisoned! Break soon the wall of this prison, that I may fly to You and come back no more. Jesus, the administer of the Most Holy Trinity to creatures. It is needless to talk about my poor state – about how I have reduced myself; it would be wanting to embitter and deepen the wounds of my soul. Therefore I let everything pass in silence, making an offering to the Lord. The Queen Mama is enriched with the three prerogatives of the Most Holy Trinity. This morning, while I was in my usual state, I saw an endless light before me, and I comprehended that in that light dwelled the Most Holy Trinity. I also saw the Queen Mama before that light; She was all absorbed in the Most Holy Trinity, and She absorbed all Three Divine Persons within Herself, in such a way as to be enriched with the three prerogatives of the Sacrosanct Trinity – which are Power, Wisdom and Charity. And just as God loves mankind as part of Himself, and as a particle that came out of Him, and He ardently desires that this part of Himself return into Himself, so does the Queen Mama, by participating in this, love mankind with passionate love. Luisa sees the Most Holy Trinity. As I was in my usual state, I seemed to see the Most Holy Trinity. They were looking at One Another, and in those gazes Their beauty was so great that They would remain ecstatic at the mere gazing upon One Another. In this state They overflowed with love, and were as though stirred by that love, to then become more intensely ecstatic. So, all of Their good and delight was comprised within Themselves, and the whole of Their eternal life, beatitude and exercise, was enclosed in this word alone: ‘Love’. 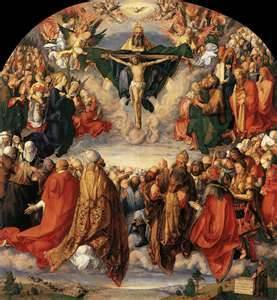 And the whole beatitude of the Saints was formed by this perfect operating of the Most Holy Trinity. While I was seeing this, the Son assumed the form of the Crucified, and coming out from Their midst, He came to me, sharing with me the pains of the crucifixion. And while remaining with Me, He brought Himself once again into Their midst, and offered His sufferings and mine, satisfying for the love that all creatures owed Them. Who can say Their delight, and how satisfied They were by the offering of the Son! It seemed that, since in creating the creatures nothing had come out of Their interior but contained flames of love; so much so, that in order to give vent to this love They began to create many other images of Themselves – only when They receive what They have given, are They then satisfied – that is, love They gave, love They want. So, the most awful affront is to not love Them. Yet, Oh God, three times holy, who is there that loves You? The effects of fusing oneself in Jesus: taking part in His work. This produces the life of the Divine Will and the life of the Divine Love in the soul; therefore the Most Holy Trinity is formed in her. While I was praying, I was uniting my mind to the mind of Jesus, my eyes to those of Jesus, and so forth with everything else, with the intention of doing what Jesus did with His mind, with His eyes, with His mouth, with His Heart, and so forth. And as it seemed that the mind of Jesus, His eyes, etc. were spreading themselves for the good of all, it also seemed that I too was spreading myself for the good of all, uniting and identifying myself with Jesus. Now, I thought to myself: ‘What kind of meditation is this? What prayer? Ah, I am no longer good at anything! I am not even able to reflect on something!’ While I was thinking of this, my always lovable Jesus told me: “My daughter, what? Are you afflicting yourself with this? Instead of troubling yourself you should be happy, because when you were meditating at other times, and many beautiful reflections arose within your mind, you did nothing other than take part in Me, in my qualities and in my virtues. Now, since the only thing left to you is the opportunity of uniting and identifying yourself with Me, you take everything from Me. Unable to do any good by yourself, with Me you become good at everything, because desiring and wanting good produce strength in the soul which makes her grow, and which settles her in the Divine Life. Then, by uniting and identifying herself with Me, she unites with my mind, producing many lives of holy thoughts in the minds of the creatures; as she unites with my eyes, she produces many lives of holy glances in the creatures. In the same way, if she unites with my mouth, she will give life to the words; if she unites to my Heart, my desires, my hands, my steps, she will give a life for every heartbeat – life to desires, to actions, to steps… But holy lives, since I contain within me Creative Power, and therefore the soul, together with Me, creates and does whatever I do. The soul who diffuses herself in the Divine Will forms the delight of the Most Holy Trinity. It seems that blessed Jesus wants to speak about His Most Holy Will. I was diffusing myself throughout all His interior – in His thoughts, desires, affections, in His Will, in His Love, in everything, when Jesus told me with infinite sweetness: “Oh, if you knew the contentment that one who does my Will gives Me! Your heart would break with joy. See, as you were diffusing yourself in my thoughts, desires, etc., you were forming the delight of my thoughts, while my desires, fusing in yours, were playing together with them. Your affections, united to your will and to your love, running and flying into my affections, into my Will and into my Love, were kissing one another; and pouring like a rapid rivulet into the immense sea of the Eternal One, they were playing with the Divine Persons – now with the Father, now with Me, and now with the Holy Spirit. The third FIAT will bring to completion the glory and the honor of the FIAT of Creation, and will be confirmation and development of the fruits of the FIAT of Redemption. These three FIATs will conceal the Most Holy Trinity on earth. On hearing this, I was not only confused, but stunned, and I said to myself: ‘Is all this possible? There are so many. And if it is true that He has chosen me, it seems to me that this is one of the usual follies of Jesus. And then, what could I do or say from within a bed, half crippled and inept as I am? Could I ever face the multiplicity and infinity of the FIAT of Creation and of Redemption? Since my FIAT is similar to the other two FIATs, I must run together with them, multiply myself with them, do the good which they do, braid myself with them… Jesus, think of what You are doing! I am not for this much.’ But who can tell all the nonsense that I was saying? Now, my sweet Jesus came back and told me: “My daughter, calm yourself – I choose whomever I please. However, know that I begin all of my works between Myself and one creature; and then they are spread. In fact, who was the first spectator of the FIAT of my Creation? Adam, and then Eve. It surely wasn’t a multitude of people. Only after years and years did crowds and multitudes of people become spectators of It. In the second FIAT my Mama was the only spectator; not even Saint Joseph knew anything, and my Mama found herself more than in your condition: the greatness of the Creative Power of my work which She felt within Herself was such that, confused, She did not feel the strength to mention it to anyone. And if, then, Saint Joseph knew it, it was because I manifested it to him. So, this FIAT germinated like a seed within Her virginal womb; the ear of grain was formed in order to multiply It, and then It came to the light of day. But who were the spectators? Very few. In the room of Nazareth my dear Mama and Saint Joseph were the only spectators. Then, when my Most Holy Humanity grew up, I went out and I made Myself known – but not to all. Afterwards, It spread more, and It will still spread. One who does not accept the gifts of God is ungrateful. The gift of the Divine Will was given to Luisa from the time of the renewal of the mystical marriage before the Holy Trinity, thirty-two years before. Doubts and difficulties. Jesus answers them in advance. And I added: ‘Tell me, my Life, and who is my family? What is my dowry and Yours?’ And smiling, He continued: “Your family is the Trinity. Don’t you remember that in the first years of bed I took you to Heaven and we celebrated our union before the Most Holy Trinity? And the Trinity endowed you with such gifts that you yourself have not yet known them; and as I speak to you about my Will, about Its effects and value, I make you discover the gifts with which, from that time, you were endowed. I do not speak to you about my dowry, because what is mine is yours. And then, after a few days, We, the Three Divine Persons, descended from Heaven, took possession of your heart, and formed Our perpetual dwelling in it. We took the reins of your intelligence, of your heart, and of all of you; and everything you did was an outpouring of Our Creative Will over you, and the confirmation that your will was animated by an Eternal Will. The Most Holy Trinity, inaccessible Light that gives life to all. I found myself outside of myself, and I saw the Heavens opened, and a Light, inaccessible to any creature. Rays descended from within this Light, which invested all creatures – celestial, terrestrial and purging. Some rays were so dazzling that, though remaining invested, enraptured and delighted, one would not know how to describe anything of what they contained. Other rays were less dazzling, and one could describe the beauty, the happiness and the truths which they contained. However, the power of the Light was such that I myself didn’t know whether my little mind would ever be capable of going back into myself again. If my Jesus had not stirred me with His words, no human force could have pulled me back from that Light, to call me back to life. But alas! I am still unworthy of my dear Celestial Fatherland. My unworthiness forces me to wander in exile, but – oh! how hard this is for me! Then, after I prayed together with Jesus, I returned into myself. The Most Holy Trinity concurring in the creation of man. Sorrow of Jesus in seeing the will, the intelligence and the memory of man deformed. Finding myself in my usual state, I was thinking about the sorrow that my sweet Jesus suffered in the Garden of Gethsemani, when all of our sins presented themselves before His Sanctity. And Jesus, all afflicted, told me in my interior: “My daughter, my sorrow was great and incomprehensible to created mind, especially when I saw the human intelligence deformed – the beautiful image of Myself which I reproduced in it, no longer beautiful, but ugly and horrid. I endowed man with will, intellect and memory. In the first shone my Celestial Father who, as primary act communicated His power, His sanctity and His height, through which He elevated the human will, investing it with His own sanctity, power and nobility, leaving all currents between Himself and the human will open, so that it might be enriched more and more with the treasures of my Divinity. Between the human will and the Divine there was neither ‘yours’ nor ‘mine’, but everything was in common, with mutual accord. Man was Our image – Our own thing; so, he veiled Us. Our Life was to be his; therefore, as primary act He constituted his will free and independent, just as the Will of my Celestial Father was, as primary act. But how much has this will disfigured itself! Free as it was, it rendered itself the slave of most vile passions. Ah! it is the will that is the beginning of all the evils of man – it can no longer be recognized. How it decayed from its nobility – it is disgusting to look at. Now, as second act, I, Son of God, concurred by endowing man with intellect, communicating to him my wisdom and the knowledge of all things, so that by knowing them, he might enjoy them and delight in what is good. But, alas, what a bilge of vices is the intelligence of the creature! He has used knowledge to deny his Creator. Then, as third act, the Holy Spirit concurred by endowing him with memory, so that in remembering so many benefits, he might be in continuous currents of love, in continuous relations. Love was to crown him, embrace him and permeate all of his life. But how saddened the Eternal Love remains! This memory remembers pleasures, riches, and remembers even to sin, while the Sacrosanct Trinity is cast out of the gifts which It gave to Its creature. Triple affirmation of wanting to live in the Divine Will. The soul who lives in the Divine Will lives in the womb of the Most Holy Trinity. Now, seeing myself confused, almost fearing, I added: “My Life, Jesus, You make me fear with these questions. Explain Yourself better. I say it firmly, but always helped by You, and in the strength of your Will, which involves me completely, in such a way that I could not do without living in your Volition.” And He, heaving a sigh of relief, repeated: “How happy I am with your triple affirmation! Do not fear, these are nothing but reassurances, reaffirmations and confirmations, so as to impress in you the triple seal of the Will of the Three Divine Persons. You must know that one who lives in my Will must rise high – but so high as to live in the womb of the Sacrosanct Trinity. Your life and Ours must be one; therefore it is necessary, it is decorous that you know where you are, and with whom you are; that you conform to whatever We do, and that, not by force, but willingly, with love and with full knowledge, you live in Our womb. Now, do you know what Our Divine Life is? We amuse Ourselves very much in issuing from Us new images of Ourselves. We are in continuous act of forming Our images, so much so, that Heaven and earth are filled with Our images – their shadows flow everywhere. The sun is Our image, and Its light is the shadow of Ours, which covers all the earth. The heavens are Our image, which extend everywhere and carry the shadow of Our own immensity. Man is Our image, who carries Our power, wisdom and love within himself. So, We do nothing other than continuously produce Our images, which resemble Us. Now, one who must live in Our Will, living in Our womb, must form many other copies of Ourselves together with Us; she must be with Us in Our work; she must let copies and shadows of Us come out of herself, filling the whole earth and Heaven. Now, in creating the first man, We formed him with Our hands, and breathing over him, We gave him life. Once We made the first, all the others take origin from the first, and are copies of the first. Our power, flowing through all generations, reproduces copies of him. Now, since We constitute you firstborn daughter of Our Will, it is necessary that you live with Us in order to form the first copy of the soul who lives in Our Will, so that, as she lives in Us, she may receive Our attitude, and may learn with Our power to operate according to Our way. Once We have made of you the first copy of the soul who lives in Our Will, more copies will come. True adoration consists in the complete accord of the union of the Will of God with the soul. The true and perfect model of adoration is the Most Holy Trinity. One flight of the soul in the Divine Will is enough for Jesus to fill all her involuntary voids of love. I don’t know how, Jesus clasped me more tightly and raised me higher, into the midst of an unending light. I felt myself being annihilated, but my annihilation was overtaken by a Divine Life, which unleashed from Itself many different shades of beauty, of sanctity, of light, of goodness, of peace, of love, etc. ; in such a way that my nothingness was transformed by those divine shades, to the point of no longer being recognized and of enamoring the very One who had so much embellished me. And my sweet Jesus resumed His speaking: “See, my daughter, the primary act of the Divine Persons is the perfect accord of Our Will. Our Will is so unified that Will of One cannot be distinguished from That of the Other; so much so, that even though Our Persons are distinct – We are Three – Our Will is One, and this One Will produces a continuous act of perfect adoration among the Divine Persons – One adores the Other. This accord of Will produces equality of sanctity, of light, of goodness, of beauty, of power, of love, and establishes in Us the true reign of order and of peace, giving Us immense joys and happinesses, and infinite beatitudes. So, the accord of the human will with the Divine is the first link of connection between Creator and creature; and from it, the divine virtues descend into her as within a channel, producing in her true adoration and perfect love for her Creator. And rising from within that same channel of connection, she receives the different shades of the divine qualities; and every time the soul rises in order to dive into this eternal Will, she is embellished by, and acquires, as many more varieties of divine beauty. The mission of the Divine Will will veil the Most Holy Trinity upon earth, and will make man return to his origin. After writing what is written above, I began to do the adoration to my Crucified Jesus, fusing all of myself in His Most Holy Will; and my beloved Jesus came out from within my interior, and placing His most holy face close to mine, all tenderness, told me: “My daughter, did you write everything on the mission of my Will?” And I: ‘Yes, yes, I wrote everything.’ And He, again: “And what if I told you that you have not written everything? Rather, you have left out the most essential thing. So, continue writing, and add: ‘The mission of my Will will veil the Most Holy Trinity upon earth. Just as in Heaven there are the Father, the Son and the Holy Spirit, inseparable from One Another but distinct among Themselves, forming the whole beatitude of Heaven; in the same way, on earth there will be three persons who, because of their missions, will be distinct and inseparable among themselves: the Virgin, with Her Maternity which veils the Paternity of the Celestial Father and encloses His power in order to fulfill Her mission of Mother of the Eternal Word and Co-Redemptrix of mankind; my Humanity, for the mission of Redeemer, which enclosed the Divinity, and the Word, without ever separating from the Father and from the Holy Spirit, manifested my celestial wisdom – adding the bond of rendering Myself inseparable from my Mama; and you, for the mission of my Will, as the Holy Spirit will make display of His love, manifesting to you the secrets, the prodigies of my Will, the goods It contains, to make happy those who will give themselves to knowing how much good this Supreme Will contains, to love It and to let It reign in their midst, offering their souls to let It dwell within their hearts, that It may be able to form Its Life in them – adding the bond of inseparability between you, the Mother and the Eternal Word. These three missions are distinct and inseparable. The first two have prepared the graces, the light, the work, and with unheard-of pains, for the third mission of my Will, to then fuse themselves all in It without leaving their office, so as to find rest, because my Will alone is celestial rest. These missions will not be repeated, because the exuberance of grace, of light, of knowledge is such and so great that all human generations can be filled with them; even more, they will not be able to contain all the good which they contain. These missions are symbolized by the sun; in fact, in creating it, I filled it with so much light and heat, that all human generations have superabundant light. Nor did I consider that, since at the beginning of creation there were only Adam and Eve who would enjoy it, I could place the necessary light for them only, to then increase new light as the generations would grow. No, no – I made it full of light, just as it is now, and will be. For the decorum and the honor of Our power, wisdom and love, Our works are always done with the fullness of all the good which they contain; nor are they subject to increasing or decreasing. So I did with the sun: I centralized in it all the light which was to serve up to the last man. But how many goods does the sun not do for the earth? What glory, in its mute light, does it not give to its Creator? I can say that because of the immense goods it does to the earth, in its mute language the sun glorifies Me and makes Me known more than all other things together; and this, because it is full in its light, and stable in its course. When I looked at the sun which, with so much light, only Adam and Eve were enjoying, I also looked at all the living; and in seeing that that light was to serve all, my paternal goodness exulted with joy, and I remained glorified in my works. So I did with my Mama: I filled Her with so much grace, that She can give graces to all without ever exhausting even one of them. So I did with my Humanity: there is no good which It does not possess; It enclosed everything, and the very Divinity, to give It to whomever wants of It. So I did with you: I enclosed in you my Will, and, with It, I enclosed Myself. I enclosed in you Its knowledges, Its secrets, Its light. I filled your soul up to the brim; so much so, that what you write is nothing other than the outpouring of what you contain of my Will. And even though it now serves you alone, and a few glimmers of light serve a few others, I am content because, being light, more than second sun, it will make its way by itself, in order to illuminate the human generations and to bring about the fulfillment of Our works: that Our Will be known and loved, and that It reign as life in the creatures. This was the purpose of Creation – this, its beginning, and this will be the means and the end. The Creation, act of profound adoration of the Divine Trinity. I was all abandoned in the Divine Fiat; Its light eclipsed my littleness and transported me up there, even into the womb of the Eternal One, where nothing but Light, Sanctity, Beauty could be seen, which infused in me profound adoration, such that I felt my little existence changed into one single act of adoration for that God who so much loved me and loves me. Then, while my mind was wandering within the light of the Divine Volition, my lovable Jesus moved in my interior and told me: “My daughter, the Sanctity of Our Divine Being, the one Power of Our Will with which We are invested – in such a way that, even though We are distinct as Persons, yet Our Will which operates in Us, which dominates, which rules, is always one – Our equal, reciprocal and incessant Love, produce in Us the most profound adoration among the Divine Persons. So, everything that comes out of Us is but acts of profound adoration of all Our Divine Being. Having said this, He withdrew into the depth of His light, and He kept silent; and I remained there, continuing my round in the Creation, to follow that profound adoration of my Creator in all created things. Oh! how one could feel the fragrance of the divine adoration in each created thing. One could touch with one’s own hand Their adored breath; one could feel in the wind the penetrating, ruling adoration of Our Creator, which, investing the whole earth, now with light blowing, now with mighty waves, now with caressing breaths, invests us so much and calls us to the adoration of its Creator which the wind possesses. Who can tell of the strength of the wind? In a few minutes, it goes around the entire world, and now with empire, now with moans, now with feeble voice, and now screaming, it invests us and calls us to unite ourselves to that divine adoration which it gives to its Creator. Then, continuing my round, I could see the sea. In those crystal clear waters, in that continuous murmuring, in its gigantic waves, Jesus was saying that that sea was nothing other than an act of profound adoration of the divine purity, adoration of Their love which murmurs continuously, and, in the waves, adoration of the divine strength which moves everything and everyone like light straw. Oh! if the Divine Fiat were reigning in the creatures, It would let everyone read, in each created thing, the distinct adoration of Our Creator which each thing possesses; and as It would unify us with all Creation, one would be the adoration, one the love, one the glory for the Supreme Being. Oh! Divine Will, come to reign, and make it so that the Will of all be one…. Continuing in my usual abandonment in the Divine Fiat, I was feeling concerned about the privations of my sweet Jesus. Oh! how my poor soul moaned under the infinite weight of a sorrow which makes all created things say: “Where is your Jesus – the One who so much loved you? Ah! you feel that He sustains everything, you touch His beauty which He has strewn over all Creation, you see His immensity which you cannot reach. What you see are nothing other than the marks of His steps which, in passing by, He impressed upon all things created by Him; but He is not here. And you – run, search for Him, and we will accompany you, moaning together with you, to make you find the One whom you want.” And I feel like everyone speaks to me about Jesus with sorrowful notes, and as they echo in my poor heart, it is tortured by a sorrow which I myself cannot express. And the impression was such – as if I wanted to go out of my usual state. But, meanwhile, my lovable and good Jesus surprised me, and throwing His arms around my neck, told me: “My daughter, what’s wrong? What’s wrong? Calm yourself, calm yourself. How can this be? Do you perhaps want to go out from within the army of my Divine Will? Look, what an orderly, formidable and large army, such that, as it lines up within your soul, it will not be easy for you to get out. But do you know what this army is? All the knowledges about my Divine Will. In fact, having formed Its Royal Palace in you, It could not, nor was it decorous for It to remain without Its army. This army We have issued from Our divine womb in order for them to form the cortege, to defend and to all stand at attention, so as to make known to all who Our Fiat is – their Divine King – and how It wants to descend with Its whole celestial army into the midst of the peoples in order to fight the human will; but not with weapons that kill, because in Heaven there aren’t these deadly weapons, but with weapons of light, which fight in order to form the Life of my Will in the creatures. Now, you must know that the weapons of this army are the acts done in my Divine Will. Look how beautiful it is! The Royal Palace is the Light of my Fiat! The King that dominates is my Will! The Ministry, the Sacrosanct Trinity; the army, the knowledges about It; the weapons, your acts done in It. In fact, as you would have the good of knowing one of the knowledges about It, and would operate by virtue of It, you would form, in my Fiat, the weapons in the hands of each knowledge, so as to give the life of it to other creatures. But this is not all yet. Each knowledge possesses a different weapon, one different from the other. So, each knowledge I have given you about my Divine Will possesses a special and distinct weapon: one possesses the weapon of Light in order to illuminate, warm and fecundate the seed of my Fiat; another possesses the weapon of the conquering Power that dominates and rules; another, the weapon of the Beauty that enraptures and conquers; another, the weapon of the Wisdom that orders and disposes; another, the weapon of the Love that burns, transforms and consumes; another, the weapon of the Strength that knocks down, makes one die and rise again in my Divine Volition. In sum, each knowledge of mine is a divine soldier which, manifesting itself to your soul, has let the weapon of each of the offices they possess be placed by you into its hands. Look at what order they have, how attentive they are to their office, and to handling the weapon which each of them possesses in order to dispose and form the people of the Kingdom of my Divine Fiat. This army and these weapons possess the prodigious virtue of the infinite, which is such that they diffuse everywhere; and wherever there is a light, even small, in the creatures, they fight with weapons of Light against the darkness of the human will, to eclipse it and give it the Life of my Fiat; and wherever there is a seed of power or of strength, there runs the divine little soldier with its weapon of Power and of Strength, to fight the human power and strength, and make the Power and Strength of my Divine Will rise again. For all human acts this army has the opposite weapon with which to fight them, so as to make the act of my Divine Will rise again over the human act. After this, He kept silent. Then, with a more tender emphasis, He added: “My daughter, if you knew the ardor of my love that I feel, because I want to establish the Kingdom of my Divine Will upon earth, so as to realize the only purpose for which man was created. In fact, in everything that has been done by the Divine Persons, from the time when the world was created, and in what We will do, Our principle will always be that one, nor will We ever cease it: that man return into the inheritance of the Kingdom of Our Fiat, which he rejected from Us. This is so true, that in my very Incarnation, when I descended from Heaven to earth, the first purpose was the Kingdom of my Divine Will; it is into Its Kingdom – that is, in my Immaculate Mother who possessed It – that I directed my first steps; my first dwelling was within Her most pure womb, in which my Fiat held Its absolute dominion and Its Kingdom, whole and beautiful. And in this Kingdom of my Will which my Celestial Mama possessed, I began and I formed my life down here – made of pains, of tears and of expiations. I knew that I was to be the Jesus neglected, unloved, nor sought for, but I wanted to come because I could see through the centuries how my coming upon earth was to serve to form the Kingdom of my Divine Will and, by necessity, I was to redeem them first in order to obtain my first purpose. And so, even from that time, I descended from Heaven in order to come to find, to search for and to clasp to my breast the children of my Kingdom, who would search for Me, love Me, recognize Me, to the point of being unable to be without Me. Therefore, in what I did and suffered, I put a mark and I said: ‘Here I shall wait for the children of my Will; I shall embrace them, we shall love one another with one single love, with one single Will.’ And for love of them, my pains, my tears, my steps, my works, changed for Me into refreshment, into joy for my Heart drowned with love. My daughter, don’t you yourself feel how you cannot be without Me? And when, in the world, they will read these papers, they will remain astounded in hearing of the long chain of my graces, my daily comings – and for such a long time, which I have done with no one else; my long conversations which I have had with you, the many teachings I have given you, and everything that was to serve the Kingdom of my Divine Will. I felt the irresistible need to resume and redo with you all the conversations, to give you the graces and the teachings which I would have given to Adam innocent, had he not rejected the precious inheritance of my Fiat. But he broke my speaking and reduced Me to silence; and after six thousand years of silence I felt the extreme need to resume my speaking with the creature. Oh! how painful it was to contain so many secrets within my Heart, which I was to confide to her; and it was for her alone that these secrets were kept – not for others; and if you knew how much it cost Me to remain silent for such a long time! My Heart was suffocated and, delirious, It repeated dolefully: ‘Alas! I created man to have someone with whom to speak; but he was to possess my Divine Will in order to understand Me; and because he has rejected It from Me, he has rendered Me the God taciturn. What sorrow I feel!’ What suffocated love, which made Me faint – and I raved! Therefore, unable to endure any longer, I wanted to break my long silence with you – I snapped it; and from here the necessity of the ardor of my speaking – for so long, and so often, and repeatedly. And as I pour Myself out with you in speaking, I feel as if I were just now giving start to Creation; and this is why, in these papers, I am making you write the true reason for Creation, what my Will is, Its infinite value, how one is to live in It, Its Kingdom, and how It wants to reign to render everyone holy and happy. All will remain surprised in reading these papers, and will feel the need for my Fiat to live in their midst. The Divinity feels an irresistible necessity to complete the work of Creation, and It will be completed by the reigning of Our Divine Will in the midst of creatures. What would a creature do, after she has made a work with unheard-of sacrifices and for a long time – a work which costs her her life, a work of incalculable value, and which only lacked one point, one shade, one color – if she cannot complete the work that costs her so much? And as beautiful as her work is, as precious and of incalculable value as it is, such that it would form her fortune, her glory and her complete happiness, she cannot present it to the public, nor can she say that it is a complete work, because one point is missing. For this person life would change into sorrow, and she would feel the weight of her work – beautiful, yes, but incomplete. And therefore she feels unhappy, and instead of glory, she feels humiliation; and how many sacrifices would she not make? She would lay down her life in order to place that point, so as to make her work complete. How the Divine Will forms the Most Holy Trinity in the creature who lives in It. The wonders of Its acts. How true love begins from oneself. The Divine Will fecundates and sows Divine Life within the souls. The Divine Volition keeps investing me. I feel Its motion within me speaking as It moves, but with such an eloquence that, if It didn’t perform a miracle to make Itself understood, I would not be able to repeat what It says. Even more, It adapts Itself to my capacity, because when It speaks -Its word being a creative word – It wants to create the good contained in Its word; and if I were unable to understand, I couldn’t make that good my own, or even less, give it to others, as property of the Supreme FIAT. So I felt concerned thinking: How is it that Its motion is word? And my sweet Jesus, visiting my poor soul, all love told me: “Blessed daughter of the Divine Volition, know that where my Will reigns with Its creative Power, Its Motion and Its Word, It speaks in the works, in the steps, in the mind, in the breathing…. Wanting to establish Its Kingdom, my Will speaks in order to create Its Divine Life in each one of the acts of the creature. Therefore, it takes the greatest attention to sense where It wants to begin Its teachings. By the power of Its word, Its Will invests the human act – the breathing, the heartbeat, the thinking and the human word; and forms within it, Its Divine Work – the Breathing, the Heartbeat, the Thinking and the Divine Word. These acts rise up to Heaven and present themselves before the Most Holy Trinity. Our Divinity looks at them, and what do We find? We find Ourselves, our Life and even the Most Holy Trinity reproduced in these acts. We look at the prodigy of our Will which overwhelmed the creature with Its Power, making of her the repetition of our own Life. Oh, how happy, how enraptured We remain, because We find in her the Sanctity that resembles Us, our Love that loves Us, the Intelligence that understands Us, our Power and Goodness which move Us to love mankind through the bonds of our sweetness. We recognize ourselves in her, finding the Work of Creation as We want It to be. Beloved Jesus kept silent. I remained immersed in the sea of the Divine Volition, saying, as if stupefied: My God, what a great extent can be reached by one who lives in your Will…! And a crowd of thoughts, like many voices, were saying and saying… but I am unable to repeat them. Maybe I will be able to repeat them when I will be in the Heavenly Fatherland and possess the same language as up there. So, feeling concerned, my Highest Good Jesus continued: “My daughter, don’t be surprised. Everything is possible to my Will. True Love, when It is perfect, begins from oneself. The true model is the Most Holy Trinity. My Celestial Father loved Himself, and in His Love He generated His Son; so He loved Himself in His Son. I, His Son, loved Myself in the Father, and from this Love the Holy Spirit proceeded. By this loving of Himself, the Heavenly Father generated one single Love, one single Power, Sanctity, and so forth. He tied the inseparable union of the Three Divine Persons. When We created the Creation We loved Ourselves. We loved Ourselves in laying Heaven and in creating the sun; it was the Love for Ourselves that moved Us to create many beautiful things worthy of Us and inseparable from Us. When We created man the Love of Ourselves became more intense, and as We loved Ourselves in him our Love reproduced our Life and image in the depth of his soul. One can give nothing other than what he possesses. So, since our Love was perfect, as We loved Ourselves, We could not separate Ourselves from what was coming from within Us. Now, our Will, in wanting the creature to live in It in order to form Its Kingdom, loves Itself, and loving Itself, wants to give what It possesses. Our Will is happy only when It forms the repetition of our Life, and when It operates in the acts of the creature. Then, triumphant and victorious, and with highest glory and honor for Us, It brings them into our divine womb, so that We may recognize our own Life in the acts of the creature who lives in our Will. This is the meaning of loving Itself in all that It wants to do and produce: giving Itself in order to form another being similar to Itself (God). How the Kingdom of the Divine Will on earth has been decreed in the Consistory of the Adorable Trinity. The new Breath of God by which the creature will be restored. As I was thinking this, my sweet Jesus – my sweet Life – visiting my poor soul, with unspeakable goodness told me: “My good daughter, it has been decreed in the Consistory of the Most Holy Trinity that my Divine Will will have Its Kingdom on earth. As many prodigies as this will take, so many We will do. We will not hold back anything in order to have what We want. But in operating We always use the most simple, though powerful ways, to overwhelm Heaven and earth, and all the creatures in the Act We want. You must know that in the Creation it took nothing other than our omnipotent breath to infuse life into man. But how many prodigies in that breath! We created the soul, providing it with the three powers – true image of our Adorable Trinity. With the soul, he had the heartbeat, the breathing, the circulation of the blood, the motion, the warmth, the speech, the sight…. What did it take to make all these prodigies in man? The simplest of our acts, armed with our Power – our breath – and the running of our Love which, unable to contain It any longer, ran…, ran toward him, even to the point of making of him the greatest prodigy of the entire Work of Creation. Now, my daughter, since man did not live in our Divine Will, his three powers have been obscured, and our adorable Image remained deformed in him, in such a way that he has lost the first heartbeat of God’s Love within his heartbeat, and the divine breathing within his human breathing. Or better, he hasn’t really lost it – he just does not feel it. He doesn’t feel the circulation of the Divine Life; the motion of good; the heat of the Supreme Love; the word of God in his own; the sight to be able to look at his Creator…. All has remained obscured, weakened – maybe even deformed. What does it take to restore this man? We will return again to breathe on him with stronger and growing love. We will breathe in the depth of his soul; we will blow more strongly into the center of his rebellious will – but so strongly as to shake the evils by which he is trapped. His passions will remain floored and terrified before the Power of our breath. They will feel burning by our divine fire. The human will, will feel the palpitating Life of its Creator, and it will hide Him – like a veil, so that man will return to be the Bearer of his Creator. Oh, how happy he will feel! We will restore him and heal him with our breath. We will be like a most tender mother who has a crippled child, and by breathing, whispering and blowing, she pours herself on her child; only then she will stop blowing on him – when she will have healed him and made him beautiful, like she wanted him to be. The power of Our breath will not leave him. We will stop breathing on him only when We see him coming back into our paternal arms. We want him beautiful, like Us. Only then will we feel that our child has recognized our paternal goodness, and how much we love him. Now I will continue on the same topic of the date December 18, about how our acts done in the Divine Will turn into Life. My sweet Jesus, always kind, said: “My daughter, it’s no surprise that each act of the creature – even a little I love you done in my Will and possessing by nature Its creative Life – is matured in the center of Its Divine Life, and naturally re-acquires Life. All that is done in my Will is regenerated in our eternal Love, and acquires the long generation of many Divine Lives, which are exclusively Ours. Now, good works not done in our Will can be like many beautiful ornaments within our Creative Works; some may be more beautiful than others – but never Life. Even in the order of Creation there are lives and there are ornaments. Flowers are not Lives, but they still form a beautiful ornament to the earth – though not a permanent one. Fruits are not Lives, but they serve to feed man, and to make him taste many various sweetnesses – though they are not durable, and man can’t always taste them anytime he wants. If fruits and flowers were Lives, man could enjoy them anytime he wanted. The Sun, the sky, the stars, the wind and the sea are not Lives but, being our works, how much good do they not do? They serve as the most beautiful and primary residence for man…. What are their houses compared to the great residence We made of all the Universe? There is a blue vault dotted with gold, which never fades; there is a Sun which is never extinguished; there is air which, being breathed, gives life; there is a wind which purifies and refreshes… and many more things. The effects of disturbance. The little ill one in the Divine Will. One who lives in the Divine Will forms the support for her Creator, so the Holy Trinity secures Its interests. My poor being feels the extreme need to live in the Divine Will. The bitterness and the pains that invade me are such that I feel as if they wanted to tear out the divine Fiat from inside of me. I feel, more than ever, the desire to live in It. But with all the efforts I make to live abandoned in Its arms, I still can’t do without feeling embittered, stunned, disturbed by the many troubles and hard pains that surround me, so much that I can’t take it anymore. My Jesus, Celestial Mother, help me. Can’t you see that I am about to succumb? If you don’t hold me in your arms, if you don’t continue to inundate me with the waves of your Divine Volition, I tremble and fear. What will happen to me? Please, don’t leave me! Don’t abandon me to myself in such a hard state. But as I was thinking this, my always adorable Jesus ran to sustain me in His arms, and all goodness told me: “My good daughter, do not fear, courage; I won’t leave you. I cannot leave you. The chains of my love tie me to you and make us inseparable; but then, why do you fear to be leaving my Will? Just as to enter It, it took a firm resolute act of wanting to live in It, in the same way, to get out of It, it would take another firm and resolute act; and you didn’t do this, neither will my daughter ever do it, will you? Then He added: “My daughter, you don’t know yet all the good the creature receives by living in my Will, and the great glory she gives to her Creator. Every act she does in It is a leaning of God on the creature, leaning His power of love and of sanctity. The more acts she repeats the more we trust her and the more we can lean on what is ours, since our Will is there, giving capacity and strength to the creature to receive what we want to give. But if we don’t find our Will and her acts repeated in It, we don’t know where to lean; she doesn’t have strength, capacity, or the space in which to receive our gifts and graces, so that I can trust her. Poor creature, without our Will. She, the true citadel, without doors and without sentries to defend it – exposed to all the dangers. If we want to give, it would be like exposing our gifts and our very life to uselessness and to the danger of receiving offenses and ingratitude, so that they make us turn gifts and graces into chastisements. How the truths on the Divine Will will form the regime, the law, the fierce army. The knowledge will open eyes for the possession of such a good. The seal of the Most Holy Trinity as a sign to know whether we live in the Divine will. My flight in the divine Volition continues. I can’t do without It, I would feel as if I myself were killing my own soul. Heaven is watching me, and how could I live without my life? Then, I was thinking to myself about the truths that Jesus told me about His Holy Divine Will, but like I wanted to raise doubts, not understanding well. So I said to myself: how is it possible that one can reach such a point by living in the Divine Volition? And my beloved Jesus, surprising me, all goodness said: “My blessed daughter, do not be surprised; my Will has the power to let the creature reach every place, as long as she remains with It. Now, you must know that Its kingdom will be formed and founded on the truths I have manifested. The more truths I manifest, the more sumptuous, beautiful, majestic and superabundant in goods and joys this kingdom will be. My truths will form the regime, the laws, the food, the fierce army, the defense and the very life of those who will live in It. Each of my truths will have its own distinct office: one will be the Master; one the most loving Father; one the most tender Mother who carries her daughter on her lap to protect her from every danger, rocking her in Her arms, feeding her with Her love, clothing her in light. In sum, every truth will be the bearer of a special good. See how this kingdom of my Will will be; I have been talking so much about It. I feel sorry when you are not attentive enough to write everything, because you will cause an additional good to be missing, since creatures will enjoy according to their knowledge. Knowledge will reveal the life, the light and the good for them to possess. It is almost impossible to possess a good without knowing it. It would be as if they had no eyes to see, no intelligence to understand, no hands to work, no feet to walk, and no heart to love. On the other hand, the first thing knowledge does is to give them eyes, to prevent them from being like the poor blind. It lets them look, understand and desire the good and the life it wants to give them. Furthermore, the knowledge of my truths becomes, itself, the actor and spectator transmitting its own life to the creature. Then, I was thinking to myself: how can one know whether he is living in the Divine Will? My sweet Jesus added: “My daughter, it’s easy to know it. You must know that, when my Fiat reigns in the soul, It keeps Its act in continuous operation. It cannot be present and not do something. It is life, and It must breathe, move, palpitate, make itself heard. It must have its primary operating act so the creature feels Its empire, and follows Its acts, almost continuously, in the Divine Will. Therefore, continuation is a sure sign that one lives in It. With this continuation, he feels the need of Divine breathing, motion and attitude. Therefore, if he stops his continuous acts he feels as though he is missing life, motion and everything else. Soon he restarts his continuous acts, because he knows that it would cost too much to do otherwise. It would cost him divine life, and one who has possessed It can hardly let It go. 3 effects – Love for Jesus = Detachment from themselves, Beauty = disregard for earthly things, Power = bravery to risk both blood and life for Me. Jesus waning to Luisa – Daughter, Three terrible trials are going to happen. 3 prerogatives of True Love – Constant Love without limits, strong love and love renewed together for God and Neighbor. Luisa’s vision of 3 men in the shape of 3 untamed horses let loose across Europe bringing it bloody terror. 3 steps for Luisa – Transformed interiorly in Him, operating exteriorly with Him and doing so for the benefit of all creatures and God. All is and must be done for Him, The 3 loves, heroic, ever-increasing, and love of sacrifice. 3 virtues of true love: To purify all, to triumph over all and to attain all. Luisa’s vision of the Baby Jesus in my arms from One Three emerged. Jesus gave to men six hours of my Passion so that I may die. 3 in the Garden were for help in agony the 3 on the Cross were for help at the last gasping at death. 3 Weapons that Combat Anxiety – : purity of intention, the right work ­ good in itself ­ of victim and of sacrificing yourself for Me, and having the sole purpose to love Me. THREE wounds that give Me (Jesus) mortal pain and such bitterness of sorrow as to surpass all the other wounds together. “[First:] These are the pains of My loving souls. “The second mortal wound of My Heart is ingratitude. “The third [wound] is obstinacy. What mortal wound to My Heart! “My daughter, the First Fiat was said in Creation without the intervention of any creature. For completion of the Second Fiat I chose My Mama. Now for the completion of both I want to say the Third Fiat, which will complete the glory [and] honor of the Fiat of Creation, as well as will be the confirmation and development of the fruits of the Fiat of Redemption. These THREE Fiats will veil the Sacrosanct Trinity on the earth, and I will have the Fiat Voluntas tua, come in Cielo cosi in terra. These THREE Fiats will be inseparable; one will be life of the other. They will be One and Triune, but distinct among themselves. “These THREE Fiats have the same value and power. “My daughter, these THREE ‘Fiats’ are the Creating, the Redeeming, [and] the Sanctifying [Fiats]. In creating man I endowed him with THREE powers—intellect, memory, and will. Moreover, with THREE ‘Fiats’ I will complete the work of the sanctification of man. “This generation will not end if My Will does not reign on the earth. My Redeeming Fiat will put Itself in the middle, between the Creating Fiat and the Sanctifying Fiat. The THREE will mix together and will complete the sanctification of man. The Third ‘Fiat’ will give such grace to the creature as to make her return as if to her state of origin. And then, when I have seen man as he came forth from Me, My work will be complete and I will take My perpetual repose in My last ‘Fiat.’ Only life in My Volition will restore man to his state of origin. I stayed in prison THREE hours. In so doing, I wanted to restore the THREE epochs of the world: the law of nature, the written law, and the law of Grace. I wanted to free everyone, reunite everyone, and give them the freedom that belongs to my sons. By staying THREE hours, I wanted to restore the THREE stages of man: childhood, youth, and old age. “How happy your THREE affirmations make Me! Fear not, they are but reaffirmations and confirmations to seal in you the triple seal of the Volition of the THREE Divine Persons. Suffering was I crying out? Ah, no! You are deceiving yourself if you think that. I loved suffering to the point of folly; I loved death in order to give Life to my children. That was the cry of all the human family together echoing in my Humanity. I, crying out together with them, repeated THREE times: ‘If it is possible, let this chalice pass from Me!’ I cried out in the name of all humanity in so far as all humanity was a part of Me, and I felt oppressed and crushed. Now I come to you. After calling my Celestial Mother I called you so that all human acts would have THREE seals: the first seal given by Me, the second seal given by my Mother, and the third seal given by an ordinary creature. , I beseech You for THREE kinds of daily bread. The first is the bread of your Will; . Father, without this Bread of your Will, I will never be able to receive all the fruits of my Sacramental Life, which is the second kind of bread I ask You for every day. “After that I asked for the third bread, which is material bread. “From then on I formed the epic of the Fiat Voluntas Tua upon the earth; and by saying it for [a] THREE times, in the first I impetrated, and in the second I made It descend, and in the third I formed It reigning and dominating. And as I said ‘Non mea voluntas, sed tua fiat,’ I intended to empty creatures of their will, and fill them with the Divine. …in creating man, formed diverse ways of communication between the Creator and the creature, ways that form the THREE powers of the soul: Intelligence, the means to understand my Will; memory, means to always remember It; and the will. The middle of the first two ways formed the third way to fly in the Will of its Creator. The intelligence and the memory were the help, the defense and the strength of the way of the will, because they could not deviate either to the right or to the left. “The mission of my Volition will reflect the most Holy Trinity upon the earth. And as in Heaven there are the Father, the Son, and the Holy Spirit, inseparable yet distinct among themselves, who form all the beatitude of Heaven, so also on earth there will be THREE persons who for their mission will be distinct and inseparable among themselves: The Virgin with her Maternity, which reflects the Paternity of the Celestial Father and encloses his Power to fulfill the mission of Mother of the Eternal Word and Co-Redemptrix of the human race; my Humanity, for the mission of Redeemer, enclosed in the Divinity of the Word, without ever separating Itself from the Father and Holy Spirit, manifesting my Celestial Wisdom, adding the bond to make Me inseparable from my Mother; and you for the mission of my Will. In you the Holy Spirit will make his Love overflow, manifesting to you the secrets, the prodigies of my Will, the goods It contains, to make happy those who will want to know how much good this Supreme Will contains and who want to love It and have It reign in them. They will offer their souls to let It inhabit their own hearts and form its Life in them. And the bond of inseparability among you, the Mother and the Eternal Word will remain. “These THREE missions are distinct and inseparable. With extraordinary suffering the first two have prepared the grace, the light, the work and everything for the third mission—the mission of my Will—to fuse both in It so as to find Its repose, because my Will alone is celestial repose. THREE Divine Persons; It placed in him THREE motions which were to murmur continuously, to unite with that continuous motion and murmuring of love of their Creator. And these are: the motion of the beating of the heart which never ceases, the circulation of the blood which always flows without ever ceasing, the breathing of the breath which never stops. This, in the body; in the soul there are THREE more motions which murmur continuously: the intellect, the memory and the will. But in order to manifest to the peoples the coming of Myself, Word of the Father, upon earth, I wanted and used royal authorities, learned and erudite men, so that, by their authority, they might diffuse the knowledges of the incarnate God and, eventually, also impose themselves to the peoples. In spite of this, the star was seen by everyone, yet only THREE of them move, pay attention and follow it. Then I will have THREE Kingdoms – one in the Celestial Fatherland, another in the Creation, and the third among the creatures – and each one will be the echo of the other, each one the reflection of the other. When she was nine, Luisa received Jesus in the Eucharist for the first time and Holy Confirmation, and from that moment learned to remain for hours praying before the Blessed Sacrament. When she was eleven she wanted to enroll in the Association of the Daughters of Mary – flourishing at the time – in the Church of San Giuseppe. At the age of eighteen, Luisa became a Dominican Tertiary taking the name of Sr. Maddalena. She was one of the first to enroll in the Third Order, which her parish priest was promoting. Luisa’s devotion tothe Mother of God was to develop into a profound Marian spirituality, a prelude to what she would one day write about Our Lady. The family mistook these phenomena for sickness and sought medical help. But all the doctors consulted were perplexedat such an unusual clinical case. Luisa was subject to a state ofcorpse-like rigidity – although she showed signs of life – and no treatment could relieve her of this unspeakable torment. When all the resources of science had been exhausted, her family turned to their last hope: priests. An Augustinian priest, Fr. Cosma Loiodice, at home because of the Siccardian* laws, was summoned to her bedside: to the wonder of all present, the sign of the Cross which this priest made over the poor body, sufficed to restore her normal faculties instantly to the sick girl. After Fr. Loiodice had left for his friary, certain secular priests were called in who restored Luisa to normality with the sign of the Cross. She was convinced that all priests were holy, but one day the Lord told her: “Not because they are all holy – indeed, if they only were! – but simply because they are the continuation of my priesthood in the world you must always submit to their priestly authority; never oppose them, whether they are good or bad” (cf. Volume I). Throughout her life, Luisa was to be submissive to priestly authority. This was to be one of the greatest sources of her suffering. Her daily need for the priestly authority in order to return to her usual tasks was her deepest mortification. In the beginning, she suffered the most humiliating misunderstandings on the part of the priests themselves who considered her a lunatic filled with exalted ideas, who simplywanted to attract attention. Once they left her in that state for more than twenty days. Luisa, having accepted the role of victim, came to experience a most peculiar condition: every morning she found herself rigid, immobile, huddled up in bed, and no one was able to stretch her out, to raise her arms or move her head or legs. As we know, it required the presence of a priest who, by blessing her with the sign of the Cross, dispelled that corpse-like rigidity and enabled her to return to her usual tasks (lace-making). She was a unique case in that her confessors were never spiritual directors, a task that Our Lord wanted to keep for himself. Jesus made her hear his voice directly, training her, correcting her, reprimanding her if necessary and gradually leading her to the loftiest peaks of perfection. Luisa was wisely instructed and prepared during many years to receive the gift of the Divine Will. The archbishop at that time, Giuseppe Bianchi Dottula (December 22, 1848-September 22,1892), came to know of what was happening in Corato; having heard the opinion of several priests, he wished to exercise his authority and assume responsibility for this case. After mature reflection he thought it right to delegate to Luisa a special confessor, Fr. Michele De Benedictis, a splendid figure of a priest, to whom she opened every nook and cranny of her soul. Fr. Michele, a prudent priest with holy ways, imposed limits on her suffering and instructed her todo nothing without his permission. Indeed, it was Fr. Michele who ordered her to eat at least once a day, even if she immediately threw up everything she had swallowed. Luisa was to live on the Divine Will alone. It was under this priest that she received permission to stay in bed all the time as a victim of expiation. This was in 1888. Luisa remained nailed to her bed of pain, sitting there for another 59 years, until her death. It should be noted that until that time, although she had accepted her state as a victim, she had only occasionally stayed in bed, since obedience had never permitted her to stay in bed all the time. However, from New Year 1889 she was to remain there permanently. In 1898 the new prelate, Archbishop Tommaso de Stefano (March 24, 1898 – 13 May 1906) delegated as her new confessor Fr. Gennaro Di Gennaro, who carried out this task for twenty-four years. The new confessor, glimpsing the marvels that the Lord was working in this soul, categorically ordered Luisa to put down in writing all that God’s grace was working within her. None of the excuses made by the Servant of God to avoid obeying her confessor in this were to any avail. Not even her scant literary education could excuse her from obedience to her confessor. Fr. Gennaro Di Gennaro remained cold and implacable, although he knew that the poor womanhad only been to elementary school. Thus on February 28, 1899, she began to write her diary, of which there are thirty-six large volumes! The last chapter was written on December 28, 1939, the day on which she was ordered to stop writing. Read: “Sanctity, Power, Love, produce in Us…”. The plurality of elements which compose the army.